WSU’s 2018 signing class: 4-star recruits, NFL bloodlines and an Australian rugby player. Plus more to come? New WSU signees Tyrese Ross and Calvin Jackson may have NFL bloodlines, but of the recruits who signed with WSU on Wednesday, Australian rugby player-turned- American football pass rusher Misi Aiolupotea-Pei has the most compelling story. It’s been a tumultuous offseason for Washington State, which, since the Holiday Bowl, has lost four assistant coaches to other schools and mourned the death of its presumptive starting quarterback. On Wednesday, National Signing Day, WSU added four signees to the original 20-man recruiting class it signed during the early signing period in December. This class includes four four-star recruits – quarterback Camm Cooper, receiver Rodrick Fisher , defensive end R.J. Stone, and running back Max Borghi, who picked WSU over Stanford — and talent spread through every position. Leach said WSU “deliberately held a couple of scholarships back” because they might still sign a second quarterback. WSU inked Elite 11 quarterback Cooper in December, but with Tyler Hilinski’s death last month, the Cougars do not have a single quarterback on the roster who has played in an FBS football game, and are hoping to sign a transfer quarterback. One such candidate could be former Syracuse signal caller Mo Hasan, a junior college recruit who visited Pullman last week but has yet to sign with any school. Of WSU’s four newest signees, two – receiver Calvin Jackson Jr. and defensive end Misi Aiolupotea-Pei – are intriguing high-ceiling junior college prospects who should compete for early playing time. The other two – offensive guard Blake McDonald and safety Tyrese Ross – are examples of how the college football coaching carousel affects the recruiting landscape. McDonald was formerly committed to UCLA under Jim Mora, but decommited when Mora was fired and replaced by Chip Kelly. Ross was originally committed to Dan Mullen at Mississippi State but pulled his verbal after Mullen left to go to Florida, and ultimately committed to WSU. Ross is the son of former Dallas Cowboys running back Dominique Ross, who played for Leach at Valdosta State in the early 90s. “I always had a good relationship with him. I liked him a lot,” Leach said of Dominique Ross, adding that this might be the first time he’s signed the son of a former player. Leach said the Cougars recruited Tyrese Ross from the beginning and kept in touch even after he committed to Mississippi State. Jackson, a receiver from Independence (Kans.) Community College, is also the son of a former NFL player. His father, Calvin Jackson Sr., played at Auburn and was a safety for the Miami Dolphins from 1994-99. Leach called the younger Jackson a “fast, skilled receiver.” Jackson Jr. originally signed with Toledo out of high school in Pompano Beach, Fla. in 2016, but was an academic non-qualifier who had to go to junior college first. He stayed in touch with the Toledo position coach who recruited him – Derek Sage, and Sage is now the outside receivers coach at WSU. He recruited Ross to Pullman. Ross and Jackson may have NFL bloodlines, but of the recruits who signed with WSU on Wednesday, pass rusher Aiolupotea-Pei who has the most compelling back story. Defensive end/linebacker hybrid Aiolupotea-Pei is from New Zealand but attended high school in Gold Coast, Australia. He grew up playing rugby but was intrigued by American football and joined a club team — the Queensland Stingrays Colts – to learn the game. Aiolupotea-Pei scored 19 touchdowns in one season, and was named the team’s MVP and offensive and defensive player of the year. That’s how Aiolupotea-Pei decided he wanted to pursue a career in American football. Per inside linebackers coach Ken Wilson, who recruited Aiolupotea-Pei out of Riverside City College, Aiolupotea-Pei’s father talked to a rugby teammate who happened to live in Riverside, Calif., and in 2015, the linebacker flew to Riverside, where he was met at the airport by his father’s former teammate, who helped the kid find accommodations and enroll at Riverside City College. “Two years and a lot of mac and cheese and top ramen later, the future and the sky is the limit for him,” Wilson said. Wilson first heard about Aiolupotea-Pei through his friend James Kuk, the Riverside City College defensive coordinator who wowed over the Australian’s sheer athletic ability. Aiolupotea-Pei joins WSU as a junior and projects as a pass rusher. At 6-3, 260 pounds, with good speed and instincts, the Cougars think the junior college transfer could even play defensive tackle if he adds some bulk to his frame. “Our biggest thing is to get him as familiar as we can with football and techniques we want him to do. We’ve just got to teach him the game,” Leach said. Six of the Cougars’ 24 2018 signees –including Cooper, running back Max Borghi and receiver Fisher – are already enrolled at WSU. 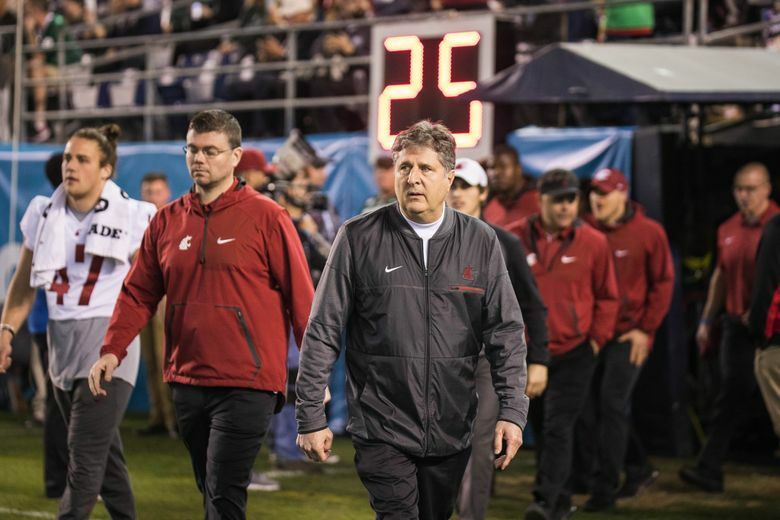 The Cougars postponed Midnight Maneuvers conditioning drills after Hilinski’s passing, and Leach said Midnight Maneuvers will now begin the week before spring break (March 12-16), with spring football commencing around March 21.